Middle Eastern ratatouille with eggs, Shakshuka 5 out of 5 based on 1 ratings. 1 user reviews. 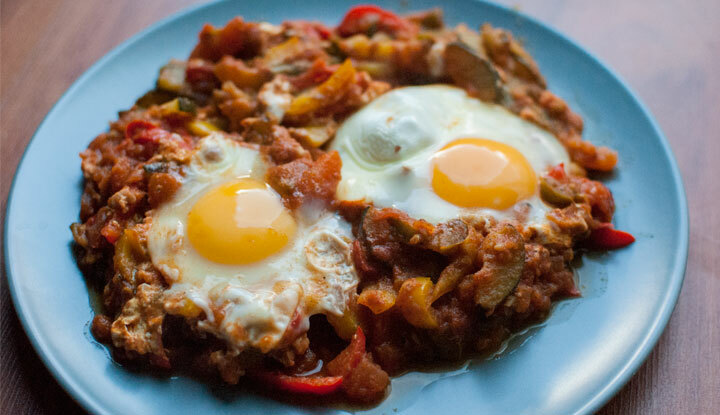 The shakshuka, a Middle Eastern ratatouille with eggs, is a simple and quick recipe to prepare. The shakshuka original recipe is made with red peppers and tomatoes, and I like to add some courgettes. For seasoning, I use Ras el hanout, a mix of spices from Morocco, paprika and cinnamon, but you can also use cumin, ginger, fresh coriander… depending on your taste. Finally the eggs provide a bit of protein so that its more filling. After a few weeks of fantastic holidays in Mexico, it’s time to get back to work! 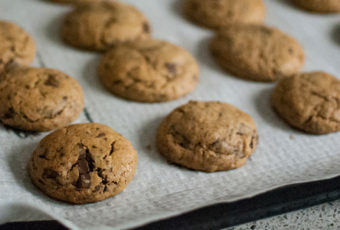 This break gave me the time to disconnect from my day to day and read a lot about what I like most in life: travel, home made cosmetics… and cooking of course! I come back with many new recipes such as this Middle eastern ratatouile, the shakshuka. The summer was very hot this year, but I have a stomach that needs lots of food, even when its 35ºC outside! I usually like to prepare big salads such as the Potato Caesar Salad or the Big Chicken Salad, but this year I decided to look into the middle eastern cuisine for a change, for its juicy vegetables scented with oriental spices recipes. I found the recipe of the Shakshuka, a middle Eastern ratatouille with eggs on Clotilde’s blog, Chocolate & Zucchini. A classic breakfast in the Tunisian and Israeli cuisine, the shakshuka is traditionally eaten with pita bread. It also looks a bit like the famous Mexican eggs, los huevos rancheros. Even if it is considered as a breakfast, the shakshuka is also perfect for a light dinner or a side dish. It is a vegetarian dish that will fill your belly. You can accommodate it in many different ways, so you can repeat it as many times as you want and always be surprised. I have found many variations on the Internet: with black beans, spinach, chard, potato, pumpkin … even the eggs can be replaced by tofu for a vegan diet. And you, what is your favourite recipe? The cinnamon perfumes the Shakshuka with a very sweet and soft aroma. 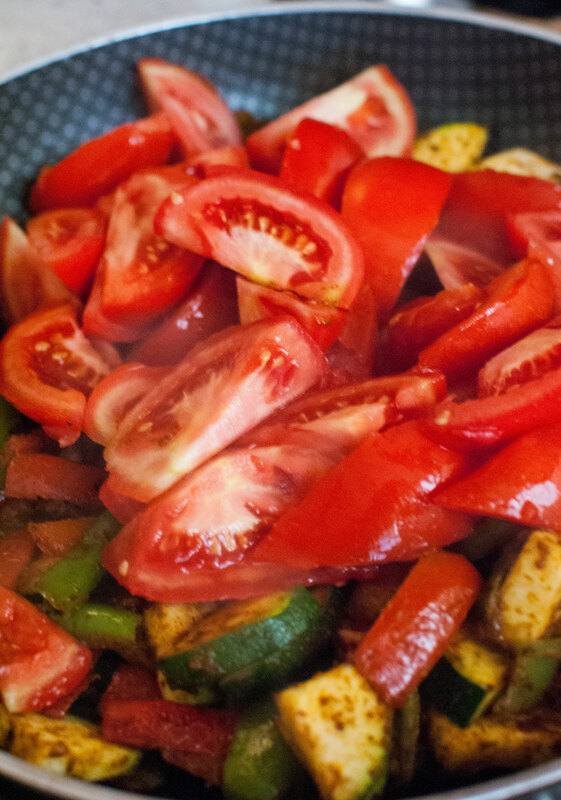 You can use the same recipe to make a quick ratatouille, if you skip the eggs. Use a tomato peeler to remove the skin of the tomatoes easily. I changed a little bit my mind regarding the original recipe I published a few months ago: I finally prefer to peel the tomatoes to get a smoother sauce. Thanks to the tomato peeler, it only takes a couple of minutes and it really makes a difference. Break the eggs one by one into a glass, and pour them separately in the pan to avoid shell drops into the sauce. Do not hesitate to turn up the heat to make the sauce very thick before adding the eggs, so that the egg whites hold together. Seasoning: salt, black pepper, coriander seeds etc. Clean all the vegetables and cut the peppers first into small slices. Heat the olive oil in a large pan over medium heat. 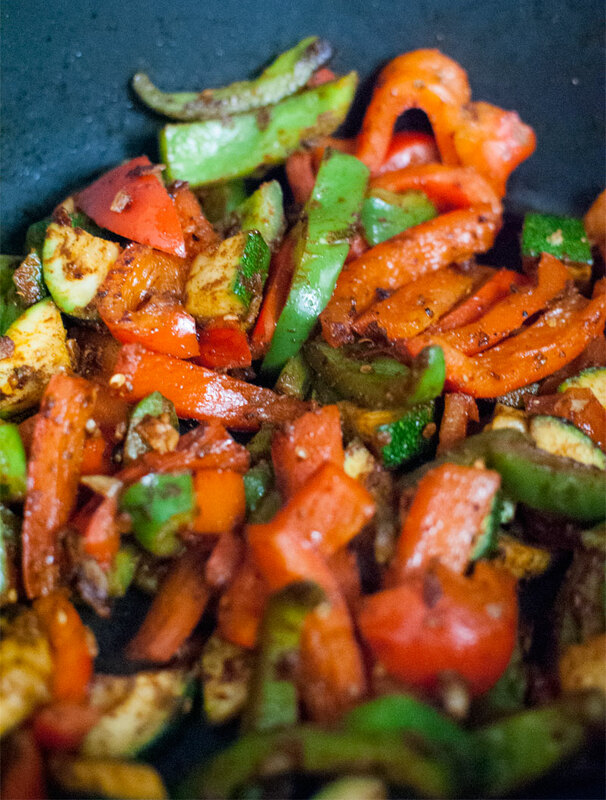 When the oil is hot, sauté the peppers until soft, about 10 minutes. In the meantime, chop the courgette and incorporate the pieces immediately into the pan. Peel and chop the tomatoes in another dish and put aside. Chop the chilli pepper. Once the peppers are soft, sprinkle with the spices, Ras el hanout, cinnamon and paprika, the chili peppers and the seasoning. Cook until the spices are fragrant, for about 1 minute. Stir the tomatoes in the pan, mix well and simmer over a low heat until the tomatoes fall apart and the liquid has evaporated, 20 to 30 minutes, stirring occasionally. When the sauce is ready, make 4 small holes in the sauce at each corner of the pan, break the eggs one by one into a glass and pour each of them into a hole. 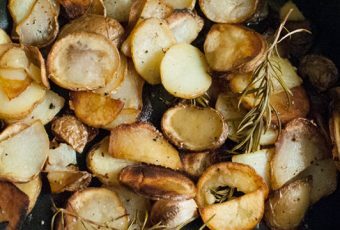 Let them cook until the eggs are white, about 15 minutes, sprinkle with parsley and serve hot. Bon appétit!